On Saturday, April 14, 2018 Legislator Anker attended the 2018 North Shore Little League 2018 Opening Day Ceremonies and Parade of Players at the North Shore Little League Complex in Rocky Point. Legislator Sarah Anker at the 2018 North Shore Little League 2018 Opening Day Ceremonies. Rocky Point, NY - April 23, 2018 - On Saturday, April 14, 2018, Legislator Anker attended the 2018 North Shore Little League 2018 Opening Day Ceremonies and Parade of Players at the North Shore LIttle League Complex in Rocky Point. The North Shore Little League is made up of 71 baseball and softball teams and over 850 players. 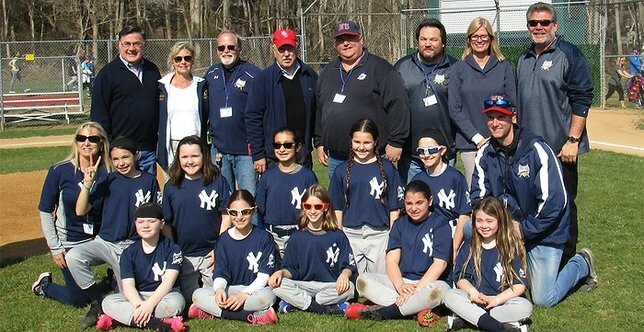 "I was honored to have been able to celebrate the coming of springtime with the North Shore Little League at it Opening Day ceremonies," said Legislator Anker. "I would like to thank the parents, volunteers, and coaches who have volunteered their time to make the program so enjoyable and successul for our childen." North Shore Little League serves the communities of Mount Sinai, Miller Place, Sound Beach, Rocky Point, Shoreham and Wading River. For more information, please visit www.nsllrp.org. Subject: LongIsland.com - Your Name sent you Article details of "Legislator Anker Celebrates North Shore Little League 2018 Opening Day Ceremonies"